In 2004 I filed a report from a visit to the enterprising Mont Tauch in Fitou, a very new kind of French ‘co-op’ that was breaking the mould for these mutually-owned winemaking organisation with hundreds, sometimes thousands of small farmers as members. The Co-op was, and remains, an essential part of the French wine industry, giving its members the opportunity to farm on a small scale, but with the resources of a large organisation to call on when it comes to production, marketing, distribution and management of a complex business like selling wine. Mont Tauch had modernised and thought big, creating popular brands to compete with the biggest names of the wine world. 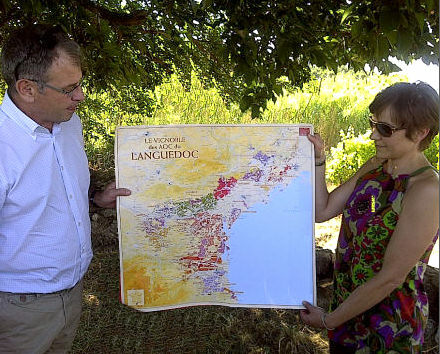 So when an invitation came in to pay a brief visit to another Languedoc co-op that was aiming high, I was intrigued to learn their story and accepted. With 1200 member growers, Les Vignobles Foncalieu is a large co-op. It is producing wines across the Languedoc including IGP Pays d’Oc, but also from individual denominations like Corbières, Minervois, St Chinian, Fitou, Cabardès, Picpoul de Pinet and Pic St Loup. They are already well-known in the UK, selling five million bottles here annually, mainly through value brands such as ‘La Serre’, which is imported by Bibendum Wines. But I had been told that more and more emphasis was being placed on high-end and single vineyard wines, in a programme started by Foncalieu’s President Michel Bataille in 2006. Michel is pictured along with chief winemaker Delphine Glangetas. I met up with Michel over a picnic lunch by the Canal du Midi, where he told me about his vision for a “great wine programme.” He knew from the start that with 1200 members, many of whom are small farmers who have been working their vineyards for generations, that there would be a battle to be won: “It was as much a political programme as a winemaking one,” he says, “We had to keep everyone happy, even those not selected for this new programme.” Persuading everyone that this very small part of their huge operation was worth doing was a struggle, but apparently its success has meant everyone is now on board, “and very proud to be selected,” adds Michel. 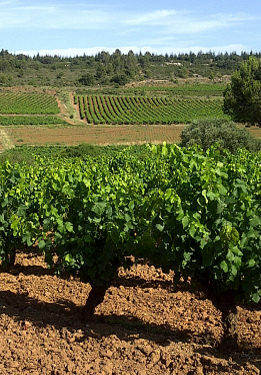 The programme began in the vineyards, where improving quality does not happen overnight. Michel says it took “a couple of years,” to achieve the required quality. There is much tighter control of when varieties are harvested, plot by plot, and much more precise viticulture across the whole company. Planting for the ‘great wines’ programme is dense at 4,000 plants per hectare and yields are controlled through shoot thinning and canopy management, bunches are removed at veraison (colour change) to leave only six bunches per vine and are aerated by leaf removal throughout the season. Harvesting is by machine, but grapes are sorted in the vineyard before being sent to a special winery built in 2007. The top vineyards are ploughed for weed control, with no spraying of herbicides. In 2012 Foncalieu was awarded the title of Best Cooperative in France by Review des Vins de France, largely due to this great wines range. It is an extraordinary project for this massive operation: the company has an annual production of 20 million bottles, but only 2,000 bottles of their top wine, Apogée, are produced and even the entry level to the great wines range, Les Illustres, accounts for just 12,000 bottles. We met up with one very contented member, the enthusiastic Romain Torecilla (right), whose beautiful Syrah vineyard in the Minervois supplies the grapes for one of the great wines range, Le Lien. 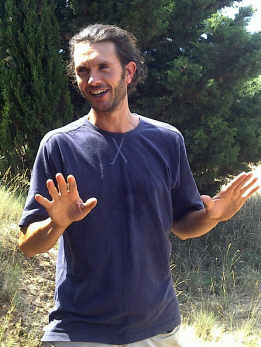 Romain has been a wine grower for 15 years, taking over from his father – he is 5th generation farming here. On a high hillside between the Pyrenees and Montagnes Noirs, there is a blend of Atlantic and Mediterranean climatic influences he says, the slopes benefitting from cooling winds from the Atlantic north. The Syrah, planted in the 1980s by Romain’s father, enjoys very favourable aspect on various slopes, and poor soils give concentration. Romain explains that he has to follow a strict specification to earn his place in the prestige wines programme, carrying out all of the procedures outlined above in his two hectares of Syrah, which eventually yields only 15 hectolitres per hectare. Later, Michel tells me that Foncalieu is now becoming a brand in its own right, and not just “a collection of brands that were basically anonymous.” The Foncalieu name is now boldly displayed on the labels of their bottles. “The origin is not hidden,” he says, which was the practice of the large coops in the past (and for many, in the present). These ‘great wines’ are extremely good, and bringing all 1200 members along on this journey is certainly a notable achievement. Having the confidence to put the name on the labels seems a logical and very suitable move. Foncalieu certainly seems to be a model modern cooperative, that as well as producing the big volumes of entry level wines to accommodate their large family of growers, recognises the potential benefits of getting the Foncalieu name in front of fine wine drinkers too. A little honey, a little oatmeal, peach and nectarine aromatics. Lovely pate, limpid and juicy, with a deal more of that limpid, nectarine pulp and juicy tangerine acidity. Lovely quality here. Delicious and quite full bodied. 88/100. £7.99, Hennings. See all stockists on wine-searcher. Pays d’Oc. Fermented in concrete and steel, with some staves for ageing. Very good Viognier aromatics, a touch of peachy lift, a certain lemon confit character and a touch of herby quality. The palate is quite full, and whilst not fantastically complex, it has good citrus, spice and a touch of melon skin and lemon peel bite. 86-87/100. £7.99, Hennings. See all stockists on wine-searcher. Organic certified, this has a pleasant, delicate, quite natural feel with cool fruit and little oak influence. The palate has lovely pure fruit, with lots of juiciness, lots of lemony flavour, just rounding out with some custard apple. Small suggestion of minerality too. 88/100. See all stockists on wine-searcher. A blend of Marsanne, Grenache and Vermentino and a touch of Viognier, partially barrel-fermented and aged. Very nice, discreet oak nose with almond and oatmeal, brings a rich quince and fig character and quite full bodied. There’s a waxiness to this, a touch of star fruit and lemon rind, giving freshness and liveliness despite relatively low acidity. Delicious. 89/100. £9.95, Le Bon Vin. See all stockists on wine-searcher. 11.5%. This is NV, but in fact was made in 2010 harvest. Honey and baked apples, a touch dried apricot. Sweet, pleasantly balanced with a touch of herbal character. 87/100. See all stockists on wine-searcher. Attractively pale, Provence colour. Very delicate raspberry and redcurrant aromas, touch of mealiness, touch of briar. The palate has good weight and texture, and a mice creamy edge to the summer fruits, but good, clean, herby acidity. 87/100. £8.99, The Secret Cellar. See all stockists on wine-searcher. Slightly roasted chestnut character, briary and cherry leading on to a palate of good, quite solid sweet fruit, some, slightly charred sweet oak character too. Has some mouth-filling sweetness 86/100. £7.99, Hennings. See all stockists on wine-searcher. Deep, vinous nose, rustic, leafy qualities, very fresh, liquorice and cherry, touch of polished wood (from staves) a touch floral too. The palate has a fine, creamy texture and a nicely bittersweet depth. Juicy, supple stuff, fairly straightforward on the palate, but delicious and structured with savoury, spicy length. 88/100. £8.99, Le Bon Vin. See all stockists on wine-searcher. this has a lovely, straightforward nose with bright and focused black fruit, there’s a touch of pastille and dusty black plum. The palate has a juicy, fleshy and quite chewy fruitiness, with solid sweetness, and good balance. Savoury and sweet, creamy yet with some grip. 88/100. See all stockists on wine-searcher. Though all of the wines in this report are part of the prestige programme, the wines below are clearly the flagship wines, listed as ‘les icônes’ and packaged in hugely heavy bottles (which I can forgive, given the tiny quantities involved). All except the blend ‘Les Illustres’ come from single denominations. These wines will all be on sale in the UK, but so far there are few listings. I have given approximate retail prices and links to find the latest stockists. Eleven growers contribute premium Syrah, Cabernet Sauvignon, Marselan and Merlot. All low yields, from 20hl/ha for the Syrah to 50hl/ha for the Marselan. Lots of cedary, sandalwood oak, deep and vinous, with copious cassis and fleshy plum on nose and palate. There is a juiciness to this, the tannins, char and enough acid to give and edge to the sweet, full and chunky fruit. Slightly too much resinous oak for me, but impressive and layered stuff. 89-90/100. £19.99, The Secret Cellar. See all stockists on wine-searcher. This is 100% Syrah, matured for twelve months in French oak barrels (80% new, 20% one-year-old). It is very deep and resonant on the nose, with plum and woodsmoke and a sense of great concentration. There’s a briary note, but that plummy depth is dominant. On the palate it is a big, powerful wine. Tannins are grippy and dry, the cherry-skin acidity good, and those dark, earthy flavours stay savoury and spicy. Wears its oak lightly, but it is in the mix of this powerhouse, masculine wine. 90-91/100. See all stockists on wine-searcher. This is 100% Syrah from the vineyards of Romain Torecilla, also matured for twelve months in French oak barrels and again 80% new, 20% one-year-old. This is a touch more aromatic than La Lumière, a little more kirsch-like and violet lift, with smooth chocolate berry aromas beneath with just a supporting sheen of oak. In the mouth that extra fruit sweetness and openness is there, this is juicier and whilst intense and concentrated, seems slightly less densely extracted than La Lumière; a little more light and shade about it. Tannins are powerful but suave and the balance is very good here. 92/100. See all stockists on wine-searcher. Big, ripe, dark and minty Syrah-dominated wine with a liquorice and black chocolate, notes of black cherry, though the oak is a touch resinous. Lovely smokiness, the palate has a nice edge of acidity, the tannins smooth but adding lean, grippy character. The finish is perhaps slightly simple: it is savoury and lean, with intensity and freshness, but perhaps not quite as complex as it might be. 90/100. See all stockists on wine-searcher. Syrah (and 5% Grenache) is harvested at just 15hl/ha after ruthless shoot thinning and green harvesting. Smoky, cedary and with a whiff of cracked pepper. The oak slightly less dominant here, and this has such supple, polished blackcurrant and black cherry fruit that is so plush and layered that it wins out. It seems to have higher acidity and more bite on the palate too, and though if broaching at this stage it would need food, the spicy, charry finish, abundant fruit and impressive concentration suggest it would be better in a few years. 92-93/100.